Entertainment Weekly has started rolling out its coverage of Infinity War, the centerpiece of a new double-issue, and we've already seen the 15 EW covers that fans will can collect when this issue hits newsstands this week. One of these images featured Robert Downey Jr.'s Iron Man, who is seen wearing the Bleeding Edge armor, that has now been confirmed for Avengers: Infinity War. The site also sat down with Robert Downey Jr., who shed some light on where Tony Stark's head is at in this movie. It has already been confirmed that Tony Stark will have a new arc reactor in his chest in Avengers: Infinity War, which many fans thought was strange since he was seen tossing his arc reactor into the sea at the end of Iron Man 3. 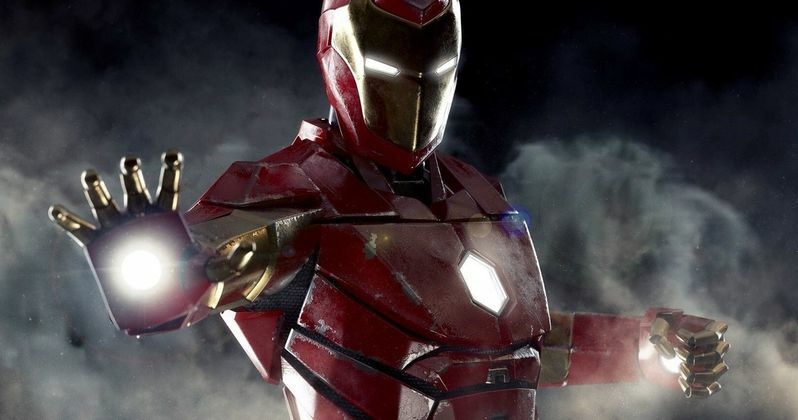 While Tony doesn't need the arc reactor to live any more, this arc reactor literally creates the Bleeding Edge armor, spreading out throughout Stark's body from the arc reactor, equipping him with rocket thrusters that jut out of his arms and back that allow him to literally fly into outer space. EW also got to sit down with Robert Downey Jr., who spoke on a number of different Infinity War topics, including Stark teaming up with Doctor Strange (Benedict Cumberbatch), Wong (Benedict Wong) and his Science Bros buddy Bruce Banner/Hulk (Mark Ruffalo). Here's what Robert Downey Jr. had to say about the dynamic between these characters. "I love how Cumberbatch just comes in and kind of draws flaming circles anywhere and can basically step into your movie. That's fun. And we wanted to keep a little bit of the Science Bros thing alive, even though Ruffalo has been on such an amazing Banner/Hulk journey himself. I really, really, really enjoyed getting to know and work with and play around with Benedict as Strange. Benedict Wong also, by the way is fantastic." When asked about Tony Stark continuing his mentor relationship with Peter Parker/Spider-Man (Tom Holland), Downey said Marvel wanted to "keep them at close quarters for as long as we can," stating that now Peter is "firing on all cylinders," but Tony is responsible for "taking them into deeper water." The actor was also asked about where Tony's head is at in this movie, since, in the past few movies, he's been trying to get out of the "superhero game," as it were. Here's what the actor had to say about that aspect of his character. "Well, let's compare him to me. If I was going to not be playing Tony for the next 10 years, I wouldn't be doing it with no plan of what I would do instead. I don't think Tony is idle, I think he is wondering. Look, when he tried to make a suit of armor around the world (in Avengers: Age of Ultron), that didn't pan out so well. Now I think his goals are smaller." While he wouldn't get into specifics, Robert Downey Jr. also spoke about bringing Gwyneth Paltrow's Pepper Potts back into the fold, after her cameo at the end of Spider-Man: Homecoming, where Tony and Pepper announced that they were finally going to get married. He added that they thought about having Tony and Pepper, "move to some eco-lodge," but every time they move somewhere, villains just "blow it up." He also joked about how every other Marvel movie presented a supposed "end of the world" scenario, although this time, in Avengers: Infinity War, it's actually true, describing it as a, "heads will roll scenario." You can head on over to Entertainment Weekly for their full interview with Robert Downey Jr., and take a look at the Bleeding Edge armor in one of 15 new EW covers below.